The inner workings of MRT's newly-released Subaru WRX/RS dog gearset. The aluminium-cased Subaru all-wheel-drive gearbox is mounted longitudinally. It contains a 5-speed gearset (with synchros on all forward gears), front differential, viscous coupling and transfer drive gears. Engine torque is passed down a lengthy main shaft (ie input shaft) to the drive gears. 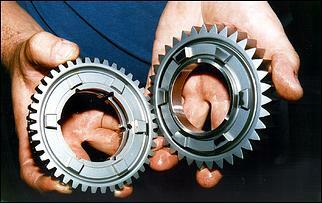 Each gear - except reverse - has helical cut (curved) teeth to maintain low noise. Adjacent to the teeth on the main shaft are the gears on the driven shaft (ie pinion shaft). Like other production vehicles, specific gear ratios are engaged between each shaft thanks to a combination of synchro rings and cast selector forks. Once this reduction ratio has taken place, torque is transmitted to the centre differential and viscous coupling. Keenly driven WRX/RSs with engine mods are likely to experience gearbox failure. This is largely due to the immense traction of the Subaru all-wheel-drive system, which (on a dry road) doesn't allow engine torque to be dissipated into wheelspin. Furthermore, those mechanically tweaked Subarus with an aftermarket (ie non-slipping) clutch will trap even larger stresses in the driveline. 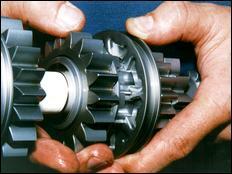 Without doubt, an up-rated clutch is a big contributing factor to gearbox problems. Note that there is one specific area where the WRX/RS gearbox is prone to failure. Most commonly, you will see teeth stripped from the 1st or 2nd drive gears (which are integrated as part of the main shaft). It's quite likely that this action will then go on to destroy the associated driven gear on the pinion shaft. Repair of such a breakage requires a new main shaft and (say) one 2nd driven gear - which Subaru retail together for around $600 (plus considerable labour expenses to install). At present, there are many theories on why this teeth stripping phenomenon occurs. 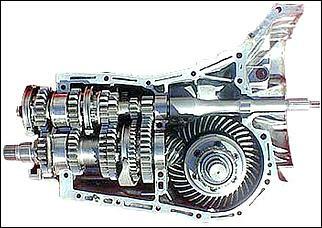 These include gearbox housing flex, insufficient gear size/quality and excessive heat. The spindly one--piece main shaft is also suspected of twisting and placing irregular loads across 1st and 2nd gear teeth. Of course, your driving style also plays a major part in determining the lifespan of a gearbox. 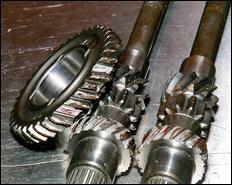 Always try to avoid abusing the gearbox with frequent high load launches and harsh gear changes. But - then again - the WRX is marketed as a high performance vehicle and we all know none of this will ever happen! Sydney's Middleton Rally Team offers a heavy-duty dog gearset to slot into the original WRX/RS housing. Retailing for AUS$6800 (plus GST and any necessary bearings), the package requires no modifications to fit, except Sti's require the 3rd/4th gear selector rod from a conventional WRX gearbox. Some later MYs may also require other small modifications. MRT presently offer the cluster in a choice of 5 ratio sets. These range from "super close" FIA-approved Group N rally gears to significantly taller road-racing gears. Note that the Group N ratios are designed to work with 4.1 or 4.4:1 STi diffs, while other ratios are available to cater for the normal 3.9:1 final drive. Starting at the back of the pressure plate, the MRT 'box features a 2-piece main shaft. 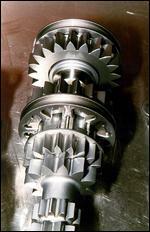 This serves to greatly reduce shaft "wind up", which is said to distort the face of 1st and 2nd gear teeth. Notice that none of the gears in the MRT gearbox have helical teeth. Each gear is straight-cut (ie spurred) to reduce drag and maintain a manageable degree of machining simplicity. Straight cut gears do not generate end thrust, which otherwise places irregular loads on the gearbox bearings and the main thrust plate. 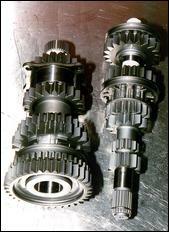 The entire gearset is constructed from EN36A gas-carburised metal, with the gears also shot-peened. Unlike the factory component, the body of the MRT driven shaft has 43 splines along its whole length. This allows the splined-inner driven gears to simply slide on, rather than being press fit. Increased strength is the main advantage of using splines to locate the gears. 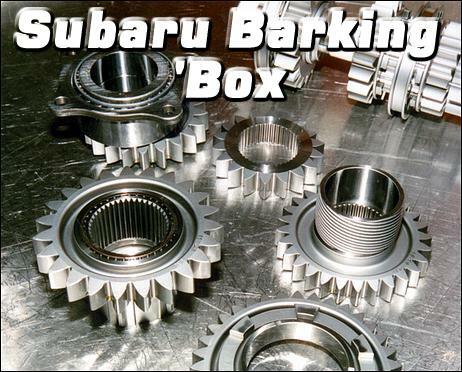 Like the main shaft, the driven shaft also features needle roller bearings for every gear (the standard Subaru gearbox has these on 3rd, 4th and 5th only). Needle roller bearings are reputed to reduce drivetrain power loss. As the name implies, the MRT dog box uses dog engagement for each gear. This means - unlike the factory gearbox - there are no synchro rings to synchronise the rotational speed of the gears being mated. Instead, each gear is grabbed by toothed dog rings (which, in this case, feature 6 teeth on 1st and 2nd and 8 teeth on 3rd, 4th and 5th). The biggest advantage of moving to dog engagement is making available more gear width where the syncho rings would otherwise be. Hence, the MRT gears are approximately 20% wider than stock. The MRT gearset retains the services of the standard WRX shift forks, which have (so far) never given any selection problems. The MRT gearset retains a helical cut speedometer signal wheel. This is necessary wherever the standard ECU, a top-end aftermarket management system or rally navigation computer needs a road speed input. It is claimed that other aftermarket gearboxes have a significantly narrower reverse gear in order to fit extra wide forward gears. The MRT gearset, however, maintains a full width reverse gear for maximum strength. Yet, despite its full dimensions, MRT tell us their complete gearset weighs less than the standard assembly. This reduction in rotating mass should equate to improved throttle response. In terms of strength, the MRT product appears very good. Brett says it's difficult to specify how much stronger than standard their dog cluster is. "We've never had one break," he explains, "and I'd say you'd bust the casing before you'd bust the gears." From our own accounts, however, it appears that the Australian-delivered WRX's rear driveshafts are the next items ready to break. In any case, you won't have to worry about stripping gears though - MRT offers a full 2-year guarantee against breakage (even under competition use). Unlike traditional dog boxes, the MRT unit is also very driveable. It is unnecessary to double-clutch on up and down-shifts, you can easily go back to 1st gear in traffic, and the six toothed dog rings make for simple stationary gear selection. Notice that on-the-fly gear changes can also be performed noticeably faster because you don't have to wait for the synchro rings to do their work - the dogs simply "bite" (if you'll excuse the pun). Without doubt, the biggest negative associated with the MRT dog box is its very high level of noise. Don't underestimate how loud a dog box can be. This constant loud whining is a direct result of having straight-cut teeth. Brett admits that a helical cut (and therefore quieter) dog box would be the best for street use - however helical gears are more subject to end thrust and are very complex to machine (which would lead to greater cost). Until a helical cut dog box comes along, we'd have to say that the MRT gearset is only for those drivers that like to play on weekends - there's no way you could put up with the noise of a dog box in an everyday vehicle. Motorsport - such as rally, circuit and drag racing - is this product's biggest outlet. Apparently 80% of MRT's present dog box sales are for rally cars - where, obviously, gearbox noise is of no importance. And what's a MRT dog-box like to drive? Brett Middleton was kind enough to give me a drive of his WRX rally car, equipped with the 'box. The gearlever on this box gave very short positive throws - and the quicker you change up, the smoother it is. There's no feel of trying to clash gears home - there's no grinding - just a short, hard 'snick' as they mesh together. Going back down the box you needed to be a bit more brutal, but again it was a relatively painless process. What wasn't painless, though, was the Godawful whining and wailing of the straight-cut gears. If it wasn't for that dreadful noise, I think that the dog-box could be an acceptable daily driver, but that noise level puts the gearbox into the category of those things best experienced when racing.... But, really, it drove far better than the 'dog box' nomenclature would lead you to expect.